In 2017 it was revealed that the public sector body had made ?41m in 10 years from toilet charges.The latest figures show Network Rail-run stations across the UK made ?3.1m from toilet charges in 2017-18.Independent watchdog Transport Focus said toilets were a "priority for improvement" at stations according to its research. It said scrapping charges was "a welcome step for passengers". Other stations run by Network Rail - including Birmingham New Street, Manchester Piccadilly and Glasgow Central - have already scrapped toilet charges. Smaller stations managed by local train operating companies may still charge for the use of facilities. 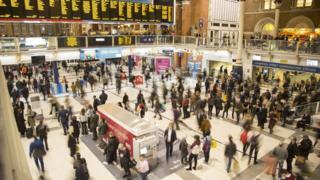 Network Rail said the move was one of a number of measures to help passengers. Other improvements being made at stations include the introduction of water fountains, better and more seating, and reducing clutter on concourses.